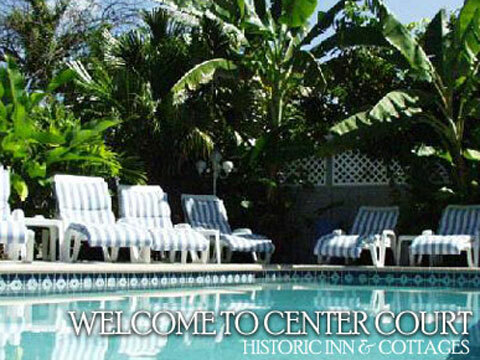 Center Court Historic Inn & Cottages is located between Duval and Simonton Streets, just off U.S. 1 (Truman Ave.) on Center Street, a quiet lane that is only two short blocks. Centrally located in Historic Old Town Key West, our units are just steps from each other and from all the excitement and attractions of world famous Duval Street. Naomi Van Steelandt, a registered nurse and the owner, supervised the design, renovation and decoration of these historic properties dating to the late 1880's and received Awards of Excellence from the Key West Historical Preservation Society in 1994 for the superb detailing and craftsmanship of the renovation. That same year, AAA awarded Center Court the prestigious Three Diamond designation. The guest house rooms, Romantic Retreat, Honeymoon Hideaway, Sunset Suite, and The Family House are delightfully arranged for maximum privacy in the gardens around the heated pool, spa, private European-style sun deck and fish/lily pond. The tropical gardens includes exotic varieties of Caribbean trees and foliage with palms, frangipani, Barbados cherry, gumbo limbo, key lime trees and fragrant flowering plants. Each accommodation is unique, historic, and decorated in a light and airy Caribbean style with original and local art, just steps apart and just minutes from all the fun and festivities Key West has to offer. Enjoy the island on a bicycle or moped-the rental is at Truman and Center Street. Excellent restaurants surround us, the Hemingway House and Lighthouse Museum are one block away, the Atlantic Ocean is a short 5-7 minute walk, Mallory Square and the Sunset Celebration is a leisurely 15 minute walk! All rooms and suites have private baths with hair dryers, CATV, telephone, fans, A/C, in room safe, and beach bags for your travels to the beach, diving, snorkeling, parasailing, sailing, kayaking or fishing. Our cottages have full kitchens with everything provided for cooking gourmet meals, gas BBQ grills with private yards to enjoy dining or star gazing in your own very private hot tub. For our business guest we offer fax service. Pets and children are welcomed in our suites and houses. We have our resident Jack Russell, Daphne, who loves to play and surf the pool. Our Black Lab, Holly, is twelve and likes to sleep. Pet's Page Come let us pamper you with our southernmost hospitality; we will make your stay in paradise relaxing, fun and stress-free with our full concierge service and helpful staff.